The new 4 series coupé (F32) from BMW has been eagerly awaited by AC Schnitzer engineers and now that it is finally here their first upgrades are ready with many more to follow. Their smart twin spoke Type VIII alloy wheels are available in 18", 19" and 20" (19" shown) and in bi-colour silver or black as well as the classic Type IV single spoke in 18" and 19". Their industry-leading performance upgrades are also available for the 420d, 428i and 435i (including X-Drive version) and offer a unique solution to boosting the car's performance while retaining full warranty cover. Other models will follow soon. The 420d gets 218hp (184hp std), the 428i 294hp (245hp std) and the 435i 360hp (306hp std). Increased torque throughout the rev range with no increase in emissions is the result of AC Schnitzer's "Efficient Performance" technology. Prices start at £2168 inc VAT - compare this to the cost of buying the next model up, especially when tax benefits are considered. The 435i, for example, is over £9000 more expensive (BMW RRP) than the 428i, and has a benefit in kind of 29% compared to just 23% for the lower model. But add our performance upgrade to the 428i and you get nearly the same power as the 435i, save over £6500 and pay less tax. 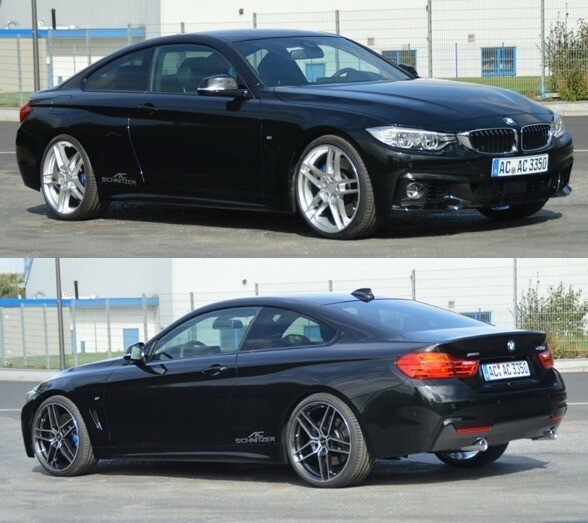 The coupé shares many components with the saloon (F30) so our lowered suspension, dual sports rear silencer and interior parts like pedal sets also fit the coupé. Call them on 01485 542000 for further details.